Weather cancellation policy: We follow the lead of the Husdon, NH School system. If the Hudson Department of Education cancels school due to weather, the guild meeting will be rescheduled for the following Monday. If by chance, the following Monday is canceled, the guild meeting will not be rescheduled a second time. 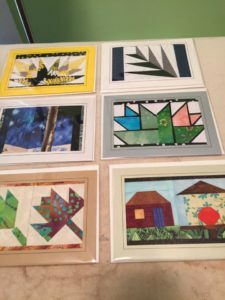 Fiber art and mixed media collage. I’ve been doing art shows in Canada and now in the US for 10 years. I have several pieces at the Mystic Art Gallery in Medford, and a February show at the Medford Coffee Roasters in Medford Square. I do many commission pieces and quilts. I play with color and textiles. My collages utilize found objects, sticks, shells, shards of glass or metal – anything with a color and shape that appeals. Cyndi Catt of Yarn & Fiber in Derry NH. 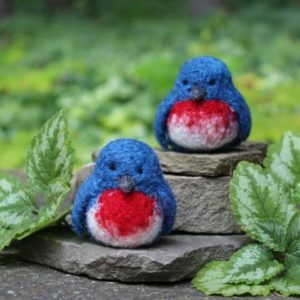 – Lecture on Needle felting and all things fiber. “My work is about color and small compositions. Each block in a quilt is made as its own element, independent of the other blocks. After all of the blocks are constructed, my goal is to arrange the small compositions to play off each other and work together to create a larger whole. What keeps me engaged is watching how the project changes and transforms with the addition of each color and texture.